In Japan there is a phrase, Jissen, which is used to distinguish real martial arts from what has been referred to as 'garden party' Karate. Jissen literally means real fighting. It is many times used in conjunction with Karate to establish the difference between combat effective martial arts and what might best be called tournament Karate. Jissen Karate is many times attributed to Choki Motobu, who was considered by many the greatest Karate master to have ever lived. During his whole life he is known only to have been beaten in combat by two individuals, one being Kentsu Yabu, a veteran of the Pacific War (World War II). It is believed that it was his war time combat experience that allowed Yabu to defeat Motobu. The other was his brother, Choyu Motobu, who had been trained in the family art of Gotente, and had the advantage of superior training. After the incident, however, Choki became a devoted student of his older brother's art. It is also known that at one time he and a friend were attacked by a gang of twenty five and in his desire to protect his untrained friend, Choki Motobu dived into battle against all twenty five, and after hurting and knocking down many of the number, the others ran rather than face the fighting fury of this great martial artist. In his youth Choki Motobu, having been born in an aristocratic family, was constantly getting in trouble, and fights, more from the expectation of being treated with respect, that was not forthcoming, than from any inherent meanness. There are those who say that Choki was crazy, mean spirited, and a belligerent fighter, and yet among those who knew him well, he was a refined gentleman, with good manners, and a quiet but humorous nature. Yasuhiro Konishi, Choki Motobu's main interpreter on Japan, said that those who ran afoul of the man usually did so because they started to treat him with disrespect, acting like he was a country bumpkin from Okinawa. While Konishi said that Motobu was basically a man of peace, who had to live down the reputation of his wildness in youth, he was not one to suffer insult well and this lead to many confrontations, in which the wise apologized and sought recompense, and the foolish ended up knocked out or demonstratively beaten. Choki Motobu referred to his art as Kempo and was very much a specialist in the use of unusual fists associated with Okinawan Karate. His favorite technique was the Ippon Ken Zuki, forefinger knuckle fist thrust, which he had developed to a very powerful level. It was said that he could actually strike a Makiwara full power with this weapon. In his famous battle with the European heavyweight boxing champion, it is believed that this was the punch which knocked the opponent out. The Jissen Kempo of Choki Motobu could be thought of to consist of certain concepts which constitute the nature of real combat. First of all, real fighting martial arts, are to be only used when your life is on the line. It is to be used to defend yourself or another, from serious injury or death. Thus the basic attitude is one of don't fight if it is not necessary. It is said that it took Choki Motobu a long time to realize this principle, but that once he did, he held to it quite well. The main two reason not to fight frivolously are simply, you may hurt your opponent and two you may get hurt yourself. It is said that after his battle with the European boxer, the man was placed on board a ship to be sent home, but died before he made it there. And in his battle with Kentsu Yabu, both men were banged up badly after the fight. It may have been these two events which turned Motobu away from fighting and towards a more peaceful lifestyle. One other important aspect of Jissen Kempo is that it included all the techniques of combat. From his Karate instructors; Kosaku Matsumora and Yasutsune Itosu; Choki Motobu learned the most important aspects of blocking, punching, striking, and kicking. From his brother Choyu; Choki learned how to throw, joint lock, and grapple in the Okinawan fashion. In comparison, Shiai Karate, or contest martial arts, develops a 'be aggressive' attitude, which may be fine in regard to a sporting match, but can be dangerous on the street. The idea of contest martial arts is to win and not lose. It is to score points without allowing the other person to score as many. All sports, including the most rugged of contests, have to have limited techniques. In actual combat, self defense, the eyes, throat, and groin, are the most targeted points. Yet in contests, in order for the competitors to survive and have a certain level of safety, these are off limits, with the exception of the groin. But even the groin is not targeted as in a self defense situation. In contests, cups are worn, and while strikes may be allowed, in actual self defense, women have reported the most effective groin technique, is to grab the testicles and squeeze until the assailant is unconscious or helpless. Choki Motobu passed his realistic methods of developing Jissen skills to many different individuals. While he did not create a particular Ryu that has a direct lineage from him and is considered his own particular method, his Kempo actually influenced the development of many different systems and in particular the Kihon Kumite, basic sparring, drills of many styles. There are three styles that reportedly were created by Choki Motobu and in some cases are suppose to have been passed on to certain individuals. According to Robert Trias, Choki Motobu created the Shorei Ryu style and this was passed on to him through a Chinese master after World War II. Trias modified the system by adding certain Goju Ryu Kata to the curriculum, thus creating his own style of Shorei Goju Ryu Karate. Shuri Ryu was also attributed to Choki Motobu by Yasuhiro Konishi who eventually passed the system on to Robert Trias, as the man most preserving Motobu's art. 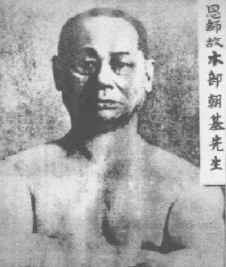 In Japan itself, the late Tatsuo Yamada called Choki Motobu's system Motobu Ryu in his teachings of Karate history. In Okinawa the term Motobu Ryu is applied to the family art of Gotente which was passed to Seikichi Uehara. Thus in discussing Motobu Ryu it is important to know whether the term is used in the Japanese manner referring to Choki Motobu's art, or in the Okinawan manner referring to Choyu Motobu's art. There is a great deal of difference, with the main one being that Choyu Motobu's art is taught in the most ancient manner without prearranged Kata. Choki Motobu taught many students during his long lifetime of seventy three years. Among his students were; James Masayoshi Mitose, Yasuhiro Konishi, Tatsuo Yamada, Shoshin Nagamine, Shinsuke Kaneshima, Yukimori Kuniba, Shinyei Kaneshima, Katsuya Miyahira, Chozo Nakama, Tsuyoshi Chitose, Tatsuo Shimabuku. Eizo Shimabuku, and Shigeru Nakamura. Among the many styles which are directly influenced by what Choki Motobu taught, especially in regard to Kihon Kumite and an intelligent application of techniques in Jissen, real fighting, are; Shorei Goju Ryu, Shuri Ryu, (Koga Ha) Kosho Shorei Ryu, Yamada Ryu, Isshin Ryu, Tozan Ryu, Shobayashi Shorin Ryu, Matsubayashi Shorin Ryu, Kobayashi Shorin Ryu, Chito Ryu, Nakamura's Okinawan Kempo, Ishimine Ryu, Shinto Shizen Ryu, Motobu Ha Shito Ryu, and Kenshinkan Ryu. Then are many modern systems which have been derived from these previously mentioned ones which owe much of the reality of their training, and the practice of Kumite, to Choki Motobu. Shoshin Nagamine admits that in his training he teaches his students the skills of Kumite as taught to him by Choki Motobu. Motobu taught that distancing was the most important factor to delivering a punch, Seiken Zuki, with fatal force. He explained that too far away, and not enough power would be in the technique at contact, but to be too close will keep the technique from developing full power. Thus it was important to master distancing. And for those situations where one was too close it was important to be able to strike properly with Uraken and Ippon Ken Zuki. In the Kumite of Shodai Soke Shoshin Nagamine's Matsubayashi Shorin Ryu are the lessons and skills as taught by Choki Motobu. There are several systems today which are very involved in the fighting sports which have been developed from the art of Karate. Each of these Shiai Karate styles, feel that they represent the best of true fighting skills, with some of them being the systems listed above which were influenced heavily by Choki Motobu. It is a shame that those of these contest styles never grew in the same manner that Motobu did. In his youth, and due to the fact that he was royalty in a time when it no longer held any meaning, Choki Motobu engaged in many battles, to uphold his honor. And many of these styles insist on hard fighting contests, some with bare knuckles, others with gloves and equipment, but all thinking they are teaching Jissen the way that Motobu did.